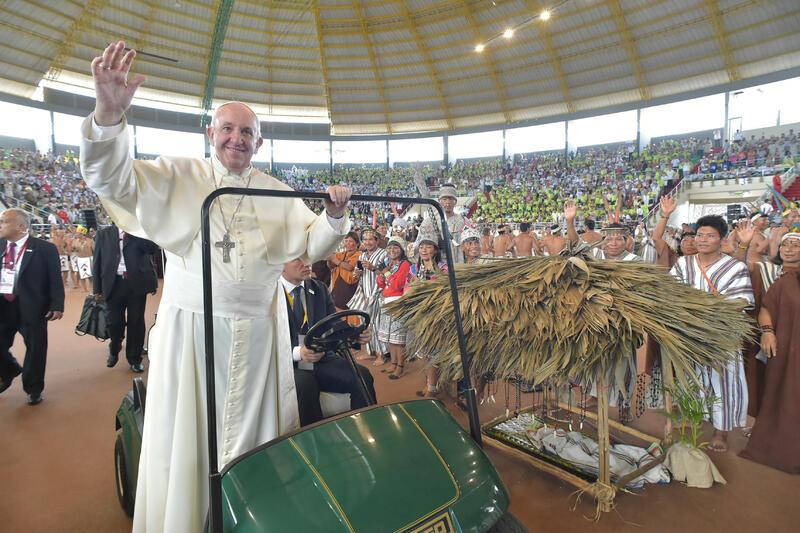 Pope Francis, during his visit to the South American countries of Chile and Peru, his 22nd Apostolic Trip, stressed this in his address to indigenous people of the Amazon region in the “Coliseo Regional Madre de Dios” in Peru today, Jan. 19, 2018. The Pope went on to lament that native Amazonian peoples have probably never been so threatened on their own lands as they are at present. “I consider it essential to begin creating institutional expressions of respect, recognition and dialogue with the native peoples, acknowledging and recovering their native cultures, languages, traditions, rights and spirituality.” The Pope called for an intercultural dialogue in which those before him would be ‘the principal dialogue partners,’ especially when large projects affecting their land are proposed. “The defense of the earth,” the Pontiff said, “has no other purpose than the defense of life.” The Pope acknowledged some of their suffering caused by emissions of hydrocarbons, which threaten lives and contaminate your natural environment. “Along the same lines, there exists another devastating assault on life linked to this environmental contamination favoured by illegal mining. I am speaking of human trafficking: slave labour and sexual abuse. This concern gives rise to our basic option for the life of the most defenseless, the Pope said, noting he thinks especially of the peoples referred to as “Indigenous Peoples in Voluntary Isolation” (PIAV). Their cosmic vision and their wisdom, the Jesuit Pope stressed, have much to teach those of us who are not part of their culture. The Pope also urged all present to listen to the elderly, noting they possess a wisdom that puts them in contact with the transcendent and makes them see what is essential in life. The Pope went on to ask his brother bishops to continue, as they are doing even in the remotest places in the forest, to encourage intercultural and bilingual education in the schools, in institutions of teacher training, and in the universities. He expressed his appreciation of the initiatives that the Amazonian Church in Peru helps carry out in favour of the native peoples. Each culture and each worldview that receives the Gospel, the Pope said, enriches the Church by showing a new aspect of Christ’s face. In this spirit, the Pope said he convoked a Synod for the Amazon in 2019. Pope Francis concluded, saying he would pray for them, for this land blessed by God, and reminding them to pray for him.